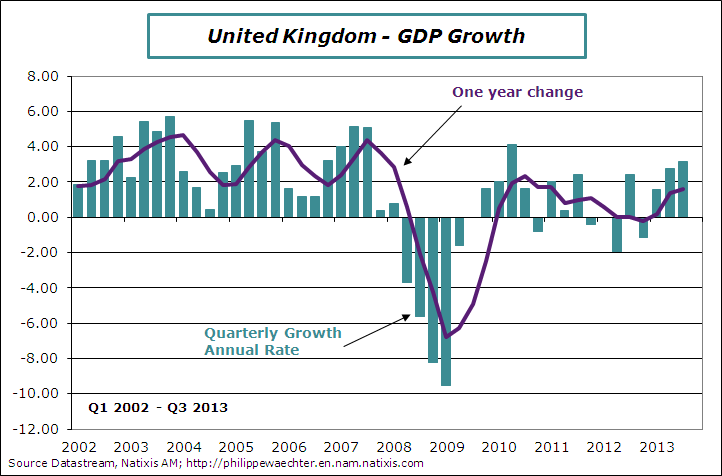 United Kingdom GDP grew by 0.8% (3.2% at annual rate) during the third quarter (preliminary estimate) . In the second quarter it was 0.7 % (2.8% AR). We see on the first chart a nice sequence of three successive increases in GDP. Compared to the third quarter of 2012, growth is 1.6%. Carry over growth is almost 1.3% for 2013 at the end of the third quarter (This is a measure of the average growth for 2013 if Q4 GDP remains at Q3 level). GDP level is still 2.5% below it Q1 2008 peak. 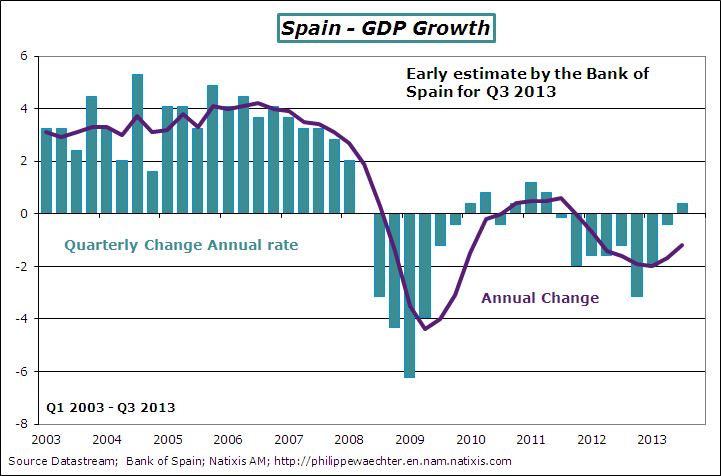 Spanish GDP grew by 0.1 % in the third quarter (0.4 % at annual rate) according to the Bank of Spain advanced estimate. This is the first bounce, even modest, of the Spanish economy after eight quarters of contraction in its economic activity. Over a year, however this latter continues to shrink at the rate of -1.2 %. The carryover growth is -1.3 % for 2013 to the end of the third quarter (average growth for 2013 if the GDP level remains at Q3 level in Q4). Spanish economic profile remains fragile. The second graph shows a rupture since 2008 and the difference with the pre-crisis trend is impressive. The third quarter figure just implies GDP stabilization at a low-level but it’s an important first step. The dynamics of the oil market has changed. The weight of emerging countries in the demand for oil is now at least equivalent to that of industrialized countries. This upheaval reflects the changing balance of the world economy during the first years of the 21st century. Given the evolution of the market and because of what it reflects in terms of economic activity, a new equilibrium has appeared, reflecting a change in the balance of power between industrialized and emerging countries. Today the minister of labor has published a press release saying that there was a mistake in the number. Instead of -50 000 the number was comprised between -22 000 and – 29 000. The main reason is the following: someone who is already at Pôle Emploi has to check his registration every month. Five days before the last day to register, Pôle Emploi sends a SMS to those who are late. There was a problem with the SMS and a large number of people did not receive the message. There were too many radiations. Is the number totally wrong or not? That’s the important question. In my analysis mentioned above I said that there were two parts in the figure. One reflects lower separation rate from companies. But the recovery is not perceived as strong enough to start hiring. I said that it was a very positive part of the figure as it means that companies start thinking differently about their activity and the labor market. This part of the analysis is unchanged and that’s good news for the French economy. It shows a change in behavior due to better prospects. The other part of the figure is linked to radiations. The lack of precision for August implies that I will wait until September figures to make a new analysis. What is puzzling with this publication is the fact that everyone has perceived that something was wrong even at the ministry of labor. There was a warning on the first page of the publication. But the figure was published. And once it is published it is considered as true. Then if there was a doubt at the ministry why was it published? The other question is to know at what moment of the procedure it has been said that it was not worrisome to publish such a figure on which there is doubt. The press release doesn’t say anything on that but that’s probably the most fascinating part of the story.